If this picture if anything to go by we won’t have many doctors left in the UK soon. 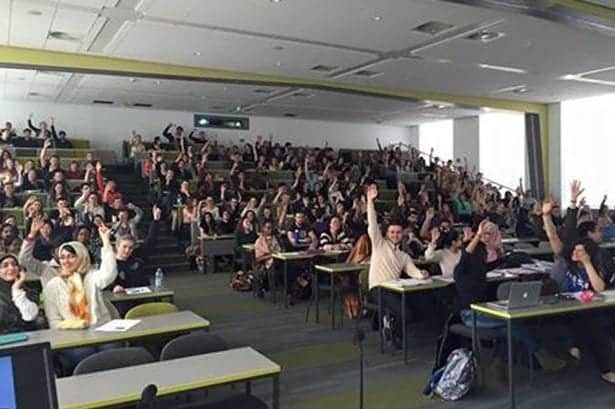 A group of medical students at the University of Birmingham were asked to put their hands up if they are going to leave the country and work abroad over the new contracts for junior doctors. Over half of the students threw their hands up, and the image is damning of the Tories mis-management of the Junior Doctors’ contract talks. If this picture represents the genera mood of trainee doctors, the future of the NHS looks bleak. They want to move away from the UK before they have even fully qualified. The medical profession have raised concerns that the new contracts will lead to longer hours and will make patient safety a huge concern. The lecturer, who was holding the seminar, said: “These are pre-clinical undergraduates not yet working in hospitals but they already realise the contract has major implications for them. “Many of them intend to cross into Scotland or Wales, where the new ­contract is not being imposed. “Others will go to places far afield, like Australia and New Zealand. This Wednesday, junior doctors will give only emergency care for 48 hours and a total strike looms is due for later in the month, which were imposed by Health Secretary after talks failed. Hunt is determined to launch a seven-days-a-week NHS, but NHS staff say it is already a 24/7 service and there are not enough staff cover his extension plans. Without any new investment or staff, the strain on existing NHS workers may well be too much, leading to a mass exodus; this image simply presses home the point.